Naturopaths can kill, but regulating them is not the answer. As a result, the question has been raised of whether or not naturopaths should be regulated in the same way as medical doctors, pharmacists, and chiropractors. New Zealand Society of Naturopaths vice-president Sharon Erdrich says the society wants tighter regulations. Even though there is “potential for harm, basically anyone in New Zealand can call themselves a naturopath,” Erdich says. Naturopathy is also enabled by tertiary institutes offering courses which are recognised by the official New Zealand Qualifications Authority framework. This means that, even though anyone can claim to be a naturopath in New Zealand (there is no law stopping them), practitioners can arm themselves with diplomas and degrees and present themselves as equal to other health professionals. That being the case, safeguards should be put in place for the public. The most useful of these would be to require naturopaths to be registered, and made subject to similar disciplinary processes demanded of other health professionals when they can’t make good on their promises. NZQA approving courses on quackery, such as their Certificate in Acute Prescribing with Homeopathy, is a real problem. But these calls for naturopaths to be registered are missing the point, I think. 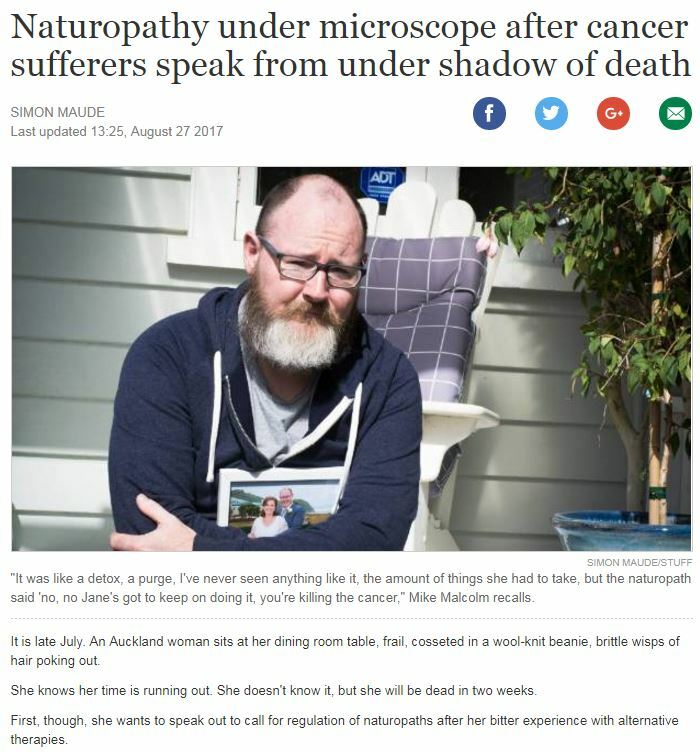 The problem is not that “anyone can claim to be a naturopath in New Zealand”; the problem is that naturopathy is quackery. We already have regulation to address quackery, the real problem is that the existing regulation is not adequately enforced. Both the Fair Trading Act 1986 and the Medicines Act 1981 prohibit the misleading claims which are the basis of the practice of naturopathy. For example, the Fair Trading Act prohibits the use of any “unsubstantiated representations”, as well as “conduct that is misleading or deceptive or is likely to mislead or deceive”, in trade. The Medicines Act prohibits the use of health testimonials (which can be both very convincing and entirely misleading), and claims to treat serious illnesses such as cancer, in advertisements. Regulation is not being considered as the ministry has not received an application from naturopaths to become regulated under the Health Practitioners Competence Assurance Act 2003. Health practitioners including naturopaths remain subject to the Health and Disability Code of Rights, “whether they are regulated or not”. Consumers may complain to the Health and Disability Commissioner about care. The Health Practitioners Competence Assurance Act 2003, which regulates professions such as medical doctors and pharmacists, also prohibits anyone from claiming or implying that they are registered as or qualified to be registered as any type of regulated health professional. This is the provision that could prevent anyone not registered from calling themselves a naturopath. We have already seen, here in New Zealand, that regulating a health profession prone to making misleading claims does not stop that practice. In research conducted by myself and Mark Honeychurch in 2016, we found that the majority of New Zealand chiropractors who advertise online make misleading claims about what they can treat. Including them in the regulatory scheme has not stopped this behaviour at all, rather it has just allowed them to continue misleading patients from a position of authority, able to use the protected title of “Dr”. The Health Practitioners Competence Assurance Act sets up authorities to regulate each health profession that is composed of members of that profession. The Medical Council, the Pharmacy Council, and the Chiropractic Board are all examples of this. But a Naturopathy Board filled with naturopaths would not be able to effectively regulate naturopaths. Quacks can’t regulate quacks effectively. All regulating them would do is give them the appearance of legitimacy and authority. The real problem with all of this regulation is that it is not enforced. The solution, therefore, should be simple: enforce it. Hear, hear. If it doesn’t pass in the scientific method of proven analysis, then it’s superstitious nonsense and needs to be relegated to the fun fair entertainments like palm reading etc.